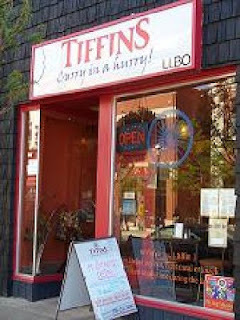 Tucked away in a tiny former shop, steps from Barrie's famed Five Points intersection, sits a tasty little gem, Tiffins Curry In A Hurry. Located at 7 Dunlop St. E., this little Indian restaurant is a bee hive of activity, from drop in customers taking a seat, business folk picking up a take out order and the phone ringing with more phone in orders. Owner, Goldie Kaur, is there in the middle of it all, her smiling face the first thing you'll likely see upon entering Tiffins. Her warmth is contagious, her passion for the business she has built with her husband, Kay Kumar, very apparent. When I was planning my first culinary tour with Dishcrawl, I sent out a small number of emails to restaurants in my target neighbourhood of downtown Barrie, just to get an idea who might be interested in participating. Within minutes, Goldie called me. She and Tiffins Curry In A Hurry were first on board and first on the tour of four restaurants that eventually took place on May 8th of this year. Goldie has great business sense and endless enthusiasm. I'm paraphrasing, but essentially what Goldie said to me is this "Why spend thousands of dollars on ads that no one is going to read? I would rather people just try the food. Then they will be back." She told me that when they first opened, they gave out free food samples during Promenade Days to promote the business. I'm sure it worked, as I became an instant fan as soon as I tried their food. Behind the swinging door into the kitchen, is the spice master himself, the quietly creative chef, Kay Kumar. Coming from a British background myself, where seasoning is spare to non existent, I am amazed by the layer upon layer of spice flavour coming through in each bite of any number of Kay's delectable dishes. I'll never know all of the secrets of Chef Kay's kitchen wizardry, but I did have the unique opportunity recently to stand beside him as he did some of his magic on Rogers TV program 'Daytime'. The studio was aromatic heaven, and the hostesses and studio staff dug eagerly into Kay's chicken biryani during commercial breaks. made in Barrie. Since then, I've been trying to reproduce it's splendour in my kitchen at home. Oh it's good, but it will never be Chef Kay's chana masala! The evening of the culinary tour, 15 eager diners met me at Tiffins Curry In A Hurry at 7:00 p.m. and Goldie greeted everyone with a smile and a glass of orange infused ice water, a welcome item on a warm day. We started with tall bowls of soul warming mulligatawny soup, another new found favourite of mine. Next, everyone was presented with a platter each of assorted delectable items to taste, spiced chicken and fish pieces, multi coloured rice, tasty aromatic samosas and a dollop of coconut chutney that I swear I could put on anything! I must admit that once I find a food I love, I order it over and over again and basically fall into a rut you might say. We all do that to some degree. You stick to what you know to be good. 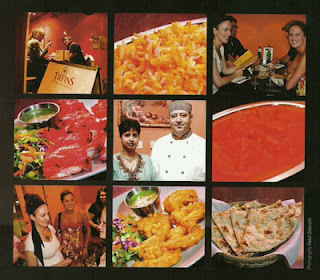 For many years, the only Indian restaurant in Barrie was Tara at the corner of Dunlop St. E. and Mulcaster St., and even after a couple of others opened up, we still only dined at Tara because we knew the food was fabulous, and the butter chicken was to die for, but we never ventured out of our comfort zone to give another Indian restaurant a go. What I was missing by doing this, besides variety of flavours and style, was the subtle differences in regional cooking within this cuisine. I learned this after ordering onion bhaji from Tiffins and wondering why it was not in ball form but more like a far east onion ring. Goldie happily explained that the round type was more likely to be Bangladeshi in origin. Aha. The moral of the story is: if you think you know Indian food, you don't know it all until you've tried Tiffins Curry In A Hurry. Just imagine if you had only ever tried one kind of hamburger in your life. Everything you've said about Tiffins, Goldie & Kay is true. It's a great restaurant with great food, and the owners are warm, welcoming people. Goldie's always willing to provide background on the food, too, which is appreciated. She taught me that British Indian soup is Mulligatawny but true Indian soup is Tomato Shorba. We try to eat there at least once every couple of weeks and, like you Mary, I often order the Chicken Tikka more often than not. It's a great rut to be in! Thanks, ScottEh! Yes, it makes a big difference when the owners are as nice as this and the food is amazing. I really feel like I'm visiting friends when I got to eat there. I hope they stick around for a long, long time.